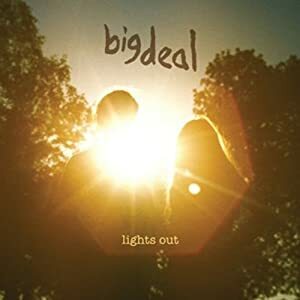 Most fortunately for we expectant listeners, England's Big Deal is a duo that absolutely does it right. The story behind how Londoner Alice Costelloe came to meet Kacey Underwood is, in itself, the perfect grounds for so endearing a partnership to forge, with a maternal run-in and some chance-happy guitar lessons eventually bringing the two together in their joint musical endeavors. Alas, Underwood's West-Coast upbringing and preoccupation with 70's rock chanced to pair up with Costelloe's Beach Boys-inspired pop sensibilities, and, a mere eighteen months later, came to fruition on debut full-length Lights Out. Where Lights Out truly shines is in its ability to portray the duo's perfect chemistry with fascinatingly stripped down songs. Costelloe and Underwood's unabashed, unfiltered, and truly unflinching sincerity compels the listener to become lost in the nostalgic but ever-present drift. 'Locked Up' is but one example of just how well-suited the two are to make music together, with a lone distant guitar yielding to the duo's on-point voices and building into the final lyric of "I'm a mess / I'm a wreck / But you wouldn't know 'cause I'm at my best when with you." Or take 'Talk', the quintessential confessional of cavernous secrets and unprofessed feelings between lovers - the track recalls the insecurity of relationships with incredible accuracy, honesty, and accessibility. Sure, Lights Out may fall short where a general lack of resources causes it to falter - be it in the voids scattered throughout the record from the non-existence of a drummer, or in the monotonous and repetitive finales of a few select tracks. Still, the couple offer up an end product with all the indications of their model chemistry - both in friendship and in euphonious pursuits - and provide a more-than-competent follow up to their 2011 EP that had wide-eyed critics in high anticipation.